Photograph of SCP-2671 taken before containment. Special Containment Procedures: SCP-2671 is to be stored in a standard storage container, and placed on a pedestal which is to be bolted to the center of the cells floor for testing purposes. All experiments conducted utilizing SCP-2671 must be approved by at least one personnel with Level 3 clearance Project Director Dave McCree (See Addendum 2671-02). SCP-2671 is not to be removed from its containment cell as it is the designated room subject to SCP-2671 effects and may cause unknown alterations to spaces other than its cell. In the even that this does occur, refer to procedure 2671.
personnel are to immediately recover SCP-2671. If this is not possible due to an anomalous effect caused by SCP-2671, personnel are to leave the room for a period of 5 seconds until SCP-2671 has produced another effect. This process is to be repeated until movement of SCP-2671 is possible, afterward, two or more designated personnel (maintaining direct eye contact at all times) are to move SCP-2671 back into its containment cell. 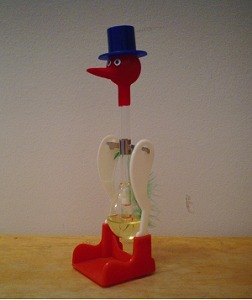 Description: SCP-2671 appears to be a standard "dipping bird" toy manufactured by the TEDCO toy company. It possesses several scratches along the toy as per normal wear, and its internal fluid has shifted color from its marketed color blue to yellow possibly due to long UV ray exposure. Despite the toy being in a workable condition, it does not preform a dipping cycle when used. SCP-2671 was discovered on 10/██/14 in the abandoned family home of the [REDACTED] family in ███████ Texas. Files recovered from the City Hall had indicated that the residence had been condemned earlier on ██/██/14, due to major fire damages. How the fire was started, and the current location of the [REDACTED] family is still unknown. Interviews with two fire investigators who were involved in the recovery site of SCP-2671 confirmed they had become witness of SCP-2671's effects. However the interviews weren't conclusive, and the investigators were administered class C amnestics. SCP-2671's original box was also recovered from the site, but depicted blue-tinted fluid instead of its current shade of yellow. SCP-2671's effects will engage after both of the following terms have been satisfied. (2). Prior to said person entering the room, there must be a 5 second period of no line of sight contact made with SCP-2671. Once satisfied, the effects of SCP-2671 will not cease until the subject has left the room. If there is more than one subject present in the room, SCP-2671's effects will not activate whatsoever. Surveillance cameras placed in SCP-2671's containment chamber have captured the anomalous transitions of its effects between frames. Its transitions are virtually instantaneous, even with examinations of light-speed camera footage capable of capturing 1 trillion FPS. Test 2671-01 : Default Procedures, See Footnote 1.
itself in front of a white background. Each had a different size with an average of 5cm X 5cm. The pictures were painted instantaneously onto the walls of the cell via an unknown process. Test 2671-02 : Default Procedures, See Footnote 1. SCP-2671 was turned completely upside down while floating 8 centimeters above it's pedestal for the period that the subject remained in the room, reverted to its normal position 10 seconds after the subject left the room. Test 2671-03 : Default Procedures, See Footnote 1. The pedestal on which SCP-2671 was originally placed had been moved with nothing anchoring it to the right wall adjacent to the container's door. The four bolts attaching the pedestal to the cell floor were delicately balanced on top of each other on the top hat of SCP-2671; SCP-2671 was found placed on the floor. Test 2671-04 : Default Procedures, See Footnote 1. SCP-2671 had been stretched over 40 times its normal width to have its ends touch the left and right walls to it, however its height and depth remained constant. Test 2671-05 : Default Procedures, See Footnote 1. The inside of SCP-2671s containment chamber had become a glass room similar to that of the inside of SCP-2671 fluid bulb, however, it did not include any of its fluid. The background presented outside of the glass bulb depicted what is believed to be an enlarged version of bedroom in the [REDACTED] family home. The room contained what appeared to be paraphernalia relating to that of a 10 year old boy. The pedestal on which SCP-2671 was placed had a miniature steel replica of its containment chamber, constructed to .02% of the cell's actual scale. Test 2671-06 : Default Procedures, See Footnote 1.
replicate the effect of one-way glass. Subjects inside the cell could see the personnel outside, but personnel on the outside saw the containment cell as normal. Test 2671-07 : Default Procedures, See Footnote 1. Everything left unchanged inside SCP-2671's containment cell, except SCP-2671 itself, which had become animate and hopped slowly while making small vocalizations. Its calling and actions were similar to that of Cyanocitta Cristata. It did not at any time attempt to fly or escape the room, even when compelled out of the chamber with bird seed. Test 2671-08 : Default Procedures, See Footnote 1. SCP-2671 showed no anomalous properties while the subject remained in the containment chamber. SCP-2671 functioned as it was designed with the cup of water provided by a researcher. Test 2671-09 : Default Procedures, See Footnote 1. SCP-2671 had generated an unknown amount of observably identical replicas of itself in a row placed to its left side. Each replica had decreased in scale by a factor of 2. Closer examination with an electron scanning microscope had identified that the replicas had been generated down to the cellular level, the row ceased at approximately 8.84 μm when duplicates of SCP-2671 were no longer possible. Test 2671-10 : Default Procedures, See Footnote 1. SCP-2671 had trans-materialized into a concrete sculpture of itself. Test 2671-11 : Default Procedures, See Footnote 1.
chamber. Test 2671-11 Result B occurred afterward. had been completely spilled out from a crack located in SCP-2671's base bulb. Test 2671-12 : Default Procedures, See Footnote 1. SCP-2671 had filled the room with approximately 40,388 standard ping-pong balls. They did not spill out from the doorway, and made a wall up to the point where the doorway ended. Test 2671-13 : One D-Class subject walking into the containment chamber backwards. SCP-2671 appeared wearing a miniature tooled leather vest and held a miniature "Bang gun" toy which deployed .05 seconds after the subject turned around. Test 2671-14 : One D-Class subject sent into the containment chamber with a video camera. SCP-2671 had been found with a red pair of plastic arms with white gloves attached to its central glass tube, they had been posed in an eye-covering position. Test 2671-15 : One Border Collie placed into the containment chamber. No effect, SCP-2671 was confirmed non-responsive to non-sapient organisms. Test 2671-16 : One D-Class subject holding a piece of paper, printed with the math problem presented below. If a right triangle's long leg is 10 inches, and its short leg is 6 inches, what is the length of the hypotenuse rounded to the nearest hundredth? The instant the D-Class subject entered the room, SCP-2671 had 2 plastic arms similar to that described in test 2671-14. SCP-2671 held a 1*2 inch white board with the number 11.66 written in blue marker onto it. "Well, it can do math. It seems to almost play with us as we test it. These experiments seem to be showing signs of sapience in this thing too, perhaps we should ask it some questions." - Dr ██████████. Test 2671-17 : One D-Class subject given a written paper asking "Who are you?". SCP-2671 was turned around toward the back wall. Test 2671-18 : Procedure in test 2671-17 repeated. SCP-2671 had its eye stickers replaced with worried-emotive eye stickers but still remained turned to face the back wall. Test 2671-19 : Procedure in test 2671-17 repeated. SCP-2671 held the miniature white board and had written the following in small text. "Why does that matter! I want to see Johnny again!!!" Test 2671-20 : One D Class personnel holding a written note asking "Who is Johnny?". SCP-2671 had sad-emoting eyes and its fluid running upward into its top bulb without leaning whatsoever. Two holes had appeared behind SCP-2671's eye stickers, and released the fluid out from the generated holes. SCP-2671's fluid did not run out for the 10 minutes that the test ran. Test 2671-21 : Procedure in test 2671-20 repeated. SCP held up a miniature white board with the text "Leave me Alone!" written on it. SCP-2671 still had its sad-emoting eyes from the previous test. A period of 48 hours was given before further testing was conducted. Test 2671-22 : Procedure in test 17 repeated. 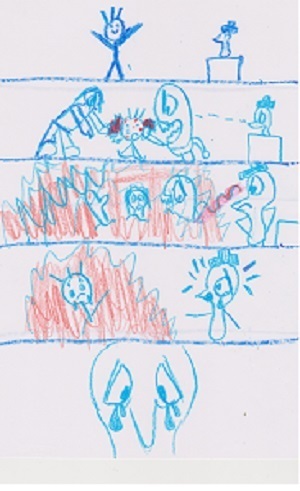 SCP-2671 had the same sad-emoting eyes as before, but had a crayon-drawn picture which has been photo-copied and filed, (See Addendum 2671-01). Test 2671-23 : Default Procedures, See Footnote 1. The walls of SCP-2671's containment chamber had been covered with 200 red arrows, all with the dimensions of 20 cm X 5 cm X cm and all inscribed with the word "GUILTY". Each was angled to point at SCP-2671. SCP-2671 still possessed sad-emoting eyes and was rocking back and fourth on its axel throughout the tests duration. Testing with SCP-2671 has clarified its level of sapience to us. But be it as it may, its sentience has seen some emotional distress that we have appeared to have caused. Per decision of project director Dave McCree, no further tests will be conducted on SCP-2671 without permission from him as of today. 1. Most tests were conducted with at least one different D class personnel entering SCP-2671's containment unit, labeled "Default Procedures".